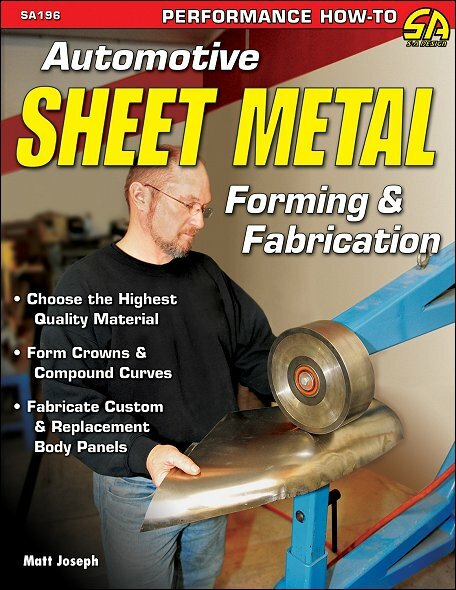 If you want to build a hot rod, customize or modify a car or truck, a motorcycle, or restore any vehicle, knowing how to form sheet metal is a crucial skill. The Motor Bookstore is proud to offer this book by Matt Joseph, a well-known and popular automotive author. From making door skins, hoods, fenders, trunk lids, roofs and many other components, the first thing you will need is a clear understanding on the subject, and that's when Automotive Sheet Metal Forming & Fabrication comes in. Packed with easy-to-understand text accompanied by sharp, detailed color photos, this is the reference you'll want by your side to show you the information you'll need to learn before you start forming your first piece of sheet metal. We think of auto body metal in different ways. When we view it as finished parts and panels, formed into consistent contours with smooth shades and accurate creases and coated with shiny finishes, we regard it as something very hard and immoveable. We see it as a rigid, static material, one that yields only to great force by crumpling into chaotic disarray. There is another way of considering steel and aluminum panel materials - malleable stuff that can be moved and persuaded, incrementally into consistent auto body panel shapes. In this view, these materials are almost endlessly formable by various mechanical processes. Some of those processes are wonderfully automated. In manufacturing, a stamping or rolling press can take flat sheet stock and force it into door skins, fenders, hoods, and the like, in one (or a few) quick operation(s). What is not seen in that sequence is the great ingenuity and effort that go into designing and fabricating the dies for the stamping or transfer presses that shape the metal. Also unseen are the time and effort spent refining the results of those forming processes to near perfection. There is also the craft of custom fabrication. This pertains to the forming of sheet metal with hammers, anvils, shot bags, wooden hammer forms, power hammers, English wheels, and numerous other devices used to work individual pieces of panel stock, one panel at a time. This work is an intricate combination of art and science, of applied force and fine judgment. It requires close observation, creativity, ingenuity, daring, restraint, and experience. It is the metal formers' craft. Success in this craft depends largely on the characteristics of the metal panel stock. If you fight those characteristics, your results probably will look crude, lack durability, and require excessive time to accomplish. The aim of this how-to book is to show you, the reader, how to perform most of the basic operations used in metal forming and fabrication. But author Matt Joseph also explains the reasons why he does certain things in a certain way. And although some of the most exotic tools and equipment also get their share of attention, the focus of the book is on the reliable basics. Ask a question about Automotive Sheet Metal Forming and Fabrication.